WASHINGTON—As his last term in office winds to a close, President Bush has directed White House aids and Cabinet staff to begin preparing for 2008, the nation's 232nd and final year in existence. "My fellow Americans, it has been an honor to be your last president," said Bush during a televised address Tuesday, assuring citizens he would do everything possible over the next few months to promote a smooth transition into utter oblivion. "I want you all to know that I do not intend to let what precious little time we have left go to waste. That's why I ask all citizens to pull together and follow me, so we can accomplish everything we've ever wanted to before it all crumbles around us in a terrible belch of smoke and ash." Added Bush, "It's now or never, people. No regrets." As part of his ambitious 11-and-a-half-month plan, Bush has prioritized winning the War on Terror in order to secure Iraq's stability in a world where the U.S. is nothing more than a fleeting memory. Additionally, he has urged Congress to block upcoming stem-cell legislation "just in case," and has set aside the months of April and May to get in touch with all countries the U.S. has wronged in the past and apologize, and default on America's $9.16 trillion dollar international debt with a wild spending spree, respectively. A special executive committee has also been formed to draft the country's final words. In response to critics who claim Bush is a lame duck and plans to pass the responsibility of helplessly watching the collapse of society onto the next president, Bush said he is "still the commander in chief," and remains dedicated to solidifying America's legacy before the darkness takes hold. "I am committed to making this the best damn Swan Song the world has ever seen," said Bush, after enclosing a copy of the Constitution and a recipe for corn dogs in an air-tight titanium capsule to be placed just across the Canadian border. "I know this looks like the end—and it is—but I intend to go out with a bang. Now, who's with me?" The president held a special America Wrap-Up press conference with members of the international press earlier today, where he spoke frankly with reporters and gave out long, heartfelt hugs. Bush also took time from his hectic schedule of staring blankly into the gaping maw of absolute dissolution to reflect on the country's past and look forward to its 281-day future. "Our great nation will be a shining, then blinking, then slowly fading beacon to the world," Bush said. "As our time as a sovereign country with borders and currency comes to a close, let us hope we will be remembered for all the great things we accomplished, and not for the 1960s." "We sure did have some good times, didn't we?" Bush added. To help the members of Congress pass the time until both houses are a jagged shell of concrete and marble, looted of valuables by roving bands of nomadic warlords to sell for spears and kerosene, Bush submitted to the Senate a short list of what he called "Dream Projects" to be carried out in the tenuous weeks following Dec. 9, 2008. The nation's last acts include approving one final all-encompassing tax break, launching a nationwide skydiving initiative, reducing carbon emissions by 1 percent over the next decade, and writing his memoirs. Members of the Bush Administration have consulted with top officials from the CIA, the FBI, NASA, the USDA, the Centers for Disease Control, noted scholars on the myth of Narcissus, a Chernobyl survivor, and the International Atomic Energy Agency to determine if the U.S. will indeed have time to carry out its final wishes. 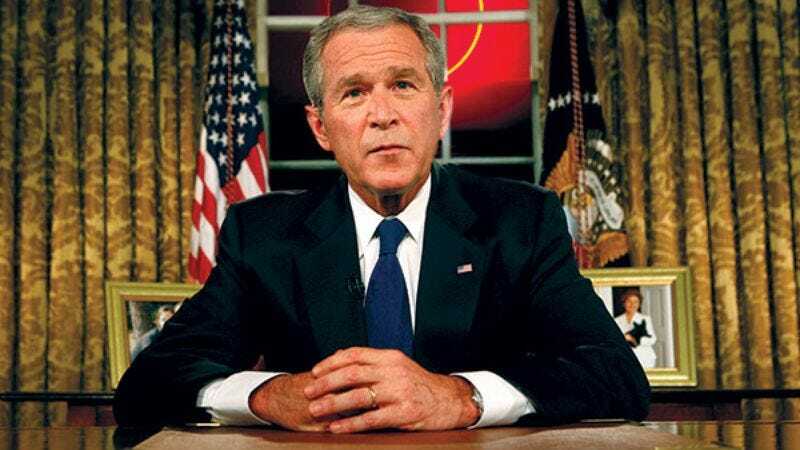 Bush, however, has instructed all Americans "not to get [their] hopes up." The Democrats, who will hold a majority in the House and Senate until the rule of law is supplanted by an especially savage series of blood feuds, have promised to work with the president for whatever it's worth. "None of that matters now, don't you see?" Speaker of the House Nancy Pelosi said. "What will it matter how many Kyoto Protocols we didn't sign or whether we're going to invade Iran in March? Have any of you ever seen a sunset—I mean really seen it?" While Congress continues to assist the president as we hurdle toward what is known in Norse mythology as Ragnarök or "Doom of the Gods," some have expressed anger at Washington's perceived unwillingness to take action in the face of the coming wall of fire. "Are we just going to sit back and wait for January?" said Chelsea Furlong, a Tennessee resident and uninsured mother of three. "That's going to take forever. My branch is closing next month—can't we just get it over with then?"